Incoterms plays an important role in China’s exports and imports. It is a the result of the long-term practice, and gradually form a unified rules that define the obligation of two parties between buyers and sellers for the delivery of commodities under sales agreements. Be sure to specify a local freight forwarder in China whose rich experience in freight forwarding industry can help you with shipping management. This latest version, made in 2010, involves costs and risks which are often unforeseeably huge. The above incoterms can be divided into two group. One of groups for any mode of transportation includes EXW, FCA, CPT, CIP, DAP, and DDP. Other incoterms are considered only suitable for sea freight and inland freight: FAS, FOB, CFR, CIF. Group E (EXW) – This is the minimum obligation for the seller. The buyer pick up the cargo from the seller at the named place. 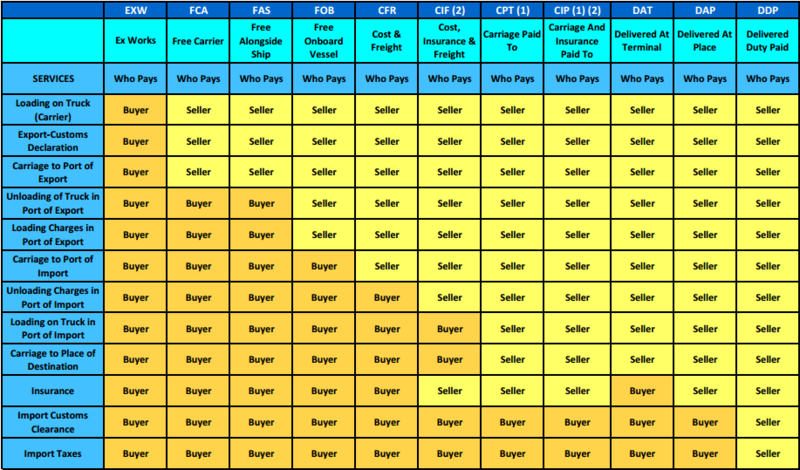 F Group (FAS, FCA, FOB) – The seller delivers to the carrier assigned by the buyer. C Group(CFR, CIF, CPT, CIP) – The seller arrange the shipping method, but don’t bear the risk of being damaged after loading. D Group(DAT, DAP, DDP) – The seller is responsible for the maximum obligation, including the risk and cost during the transportation. The delivery is completed when buyer pick up the goods from seller at the named place (warehouse, storage or factory etc. ), seller don’t clear the customs for export. Buyer controls freight from door to door. The contractual shipper on the waybill should be the buyer. The buyer will designate one freight forwarder that will arrange to pick up the shipment from the named place and undertake booking, customs declaration, inspection, and delivery to the destination. And the relevant expenses should be at the buyer’s cost. The seller’s delivery is completed when the goods across the ship’s rail. Buyer controls ocean freight routing. Fob terms requires that the seller also clears the goods for export. Generally, if you are importing from China this is the term most often used. The buyer will designate one freight forwarder that will arrange the transportation after the shipment is loaded on board the ship and undertake booking, customs clearance, inspection, and delivery to the destination. And the relevant expenses should be at the buyer’s cost. The seller’s delivery is completed when the goods across the ship’s rail at destination port. The seller have to pay for the shipment’s delivery to the destination port and declaration the customs for export. The seller will designate one freight forwarder that will arrange a trailer for transportation and undertake booking, customs declaration, inspection, and delivery to the destination. And the seller’s burdens the relevant expenses. This term is the same as CFR terms except the seller agrees to purchase marine insurance in the buyer’s interest. The seller takes responsibility for carriage, delivery the good at the named place, customs clearance. And the seller should pay for the tariff and other fee . Whether you are a buyer or a seller, you take responsibility for choosing a freight forwarder, the shipping route and date. the Control of cost is a key factor to the best incoterms. For most company and individuals, how do you think of these terms. Those terms that can reduces cost and risks for you is the appropriate terms.